After his show pen success, Dual With A Shiner transitioned to ranch work, where he also excelled. A breeding program dedicated to producing versatile athletes gives Wagonhound Land & Livestock trainers many options when deciding where to send their young horses. Wagonhound Land & Livestock has become known for turning out horses capable of winning in reined cow horse, cutting, roping and ranch competitions. They also produce horses hardy enough to be used on a ranch. Their success is, in part, due to a philosophy of giving horses the chance to show trainers what performance discipline suits them the best. Wagonhound was purchased in 1999 by Art and Catherine Nicholas, who have made the Douglas, Wyoming-based ranch one of the top producers of Western performance horses in the nation. Bloodlines often give an indication of which discipline might be the best fit for a horse, but each horse is ridden before trainers decide in which direction it should be pointed. For Wagonhound, that, that talent comes from an elite roster of mares and stallions. They rely on top bloodlines and conformation to turn out horses with the athletic ability and mentality to win in the show pen and pull their weight on the ranch’s 200,000 acres in Wyoming and Montana. Wagonhound-bred horses have amassed Equi-Stat records totaling $1.1 Million since 2007, primarily in cutting, reining and reined cow horse. 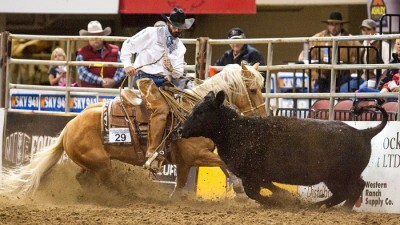 They have also posted earnings in barrel racing and rach horse versatility events. 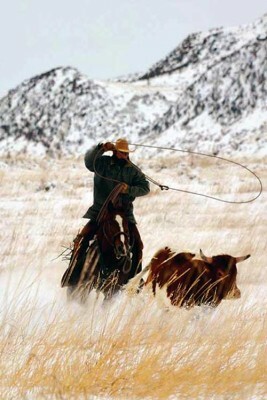 The ranch doesn’t try to breed the most horses on the range; it tries to raise the best. Hesa Hickory Cat (Wr This Cats Smart x Shiney Miss Hickory, by Shining Spark) and Matt Koch turn a cow on the fence during the AQHA Ranching Heritage Challenge. Approximately 40 horses begin their career paths the same way each fall in the training facility across the road from the breeding barns in Douglas. All horses get the same start, usually as late yearlings in November. It doesn’t take long to figure out what performance events are a match for each horse’s talents, or if the animals are better suited for ranch life. Horses that display the greatest affinity for cutting are often sent to Equi-Stat-Elite $5 Million Rider Boyd Rice. After having a chance to evaluate the horses, Rice lets Wagonhound know if a horse has the ability to compete at cutting’s elite levels. If it doesn’t the horse usually heads back to the ranch. “[Rice will] try them for a while, and if he doesn’t think they’re going to good enough for the top of the top, he’ll send them back here and we’ll make another plan for them, or try to sell them or something like that,” Koch said. Horses owned by the ranch have earned more than $638,000, according to Equi-Stat, mostly in cutting and reined cow horse competitions. Much of that versatility can be traced to the ranch’s head stallion, Equi-Stat Elite $6 Million Sire WR This Cats Smart (High Brow Cat x Smart Little Lena).